Planning summer vacations are tough: working around sports and activities, school ending and starting, making sure there’s enough PTO to cover vacays (as I’m self employed, my days off are unpaid, so that is also a factor), and of course, having the funds to do so. 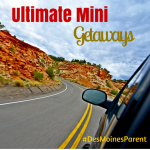 Living in Iowa, we’re at a huge advantage to have numerous fantastic road trip options within easy driving distances. Here’s some great places in the Midwest that wont leave you broke and instead leave you with priceless memories. The Plains Art Museum in Fargo is amazing. Also in Fargo is the Red River Zoo. Theodore Roosevelt National Park is gorgeous and has plenty of hiking opportunities. Kids will love Fort Lincoln Trolley and exploring Fort Lincoln State Park. It’s been about ten years since I’ve been, but I hear it’s just as fabulous now as it was then. Stop at the Corn Palace and Wall Drug on your way to the Badlands along I-90. Hike your way to Harney Peak through Black Hills National Forest, visit the Wind Caves, Mount Rushmore, Crazy Horse, and Hot Springs. There’s so much to do in this area! Perfect vacation for grade school age kids. We plan on heading there next summer (and even into Wyoming to Devil’s Tower, which is a short drive from the Black Hills). 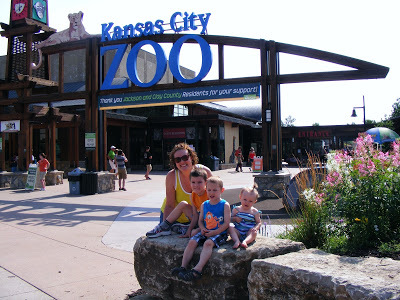 The Henry Doorly Zoo in Omaha is one of the best zoos in the country and is our absolute favorite. Plan for an entire day there (and lots of walking). There’s all new attractions coming summer 2016, included elephants and spray grounds. 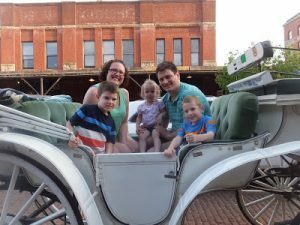 Take time for “the park with the big slides” (also known as Gene Leahy Mall) and a carriage ride through Old Market (pictured below) in the evening. The Omaha Children’s Museum is a safe bet for kids younger than 12. If you want a bit of driving, see Carhenge. A car replica of the famous Stonehenge. For more on our personal experiences at these places, visit here! Strataca is a very cool Salt Mine sitting underground. Take an underground train ride or a Salt Safari Hike through the mines. Please note that children under 4 are not allowed underground. How can you visit Kansas without visiting the Oz Museum? Watch the movie before you go (or even better, on the road trip there). See exhibits dedicated to all things Oz, including memorabilia from the movie, books, and board games. You can never go wrong with the Mall of America, but if shopping isn’t your thing, try out Valleyfair Amusement Park (just outside of Minneapolis), the Minnesota Zoo in Apple River (an easy drive from Minneapolis), or Como Park in St. Paul (complete with a free zoo and carnival type amusement park). The Sculpture Park in downtown Minneapolis (pictured below) was a great walk with our kids. If you want to take advantage of one of Minnesota’s lakes, head up North to Lake Itasca, also known as the headwaters of the Mississippi River. We’ve spent numerous weekends in the past year day tripping around Iowa. 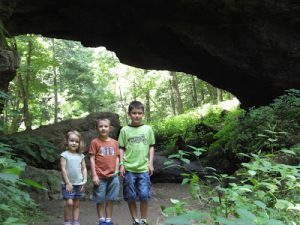 Some of our favorite adventures have been Maquoketa Caves State Park (pictured below), Field of Dreams in Dyersville (be sure to check their calendar of events. If the field is free, be sure to bring baseball gloves, balls, and bats to play on the field! ), with a day or two in Dubuque. If you plan on Dubuque, go between Memorial Day and Labor Day to ensure everything will be open. In Dubuque, we loved the Mississippi River Museum and Aquarium, Eagle Point Park, and the cable cars. 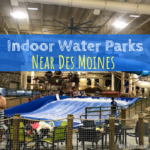 The Children’s Museum in the Coralville Mall is excellent (plan on a full day of playing) and the Loess Hills in Western Iowa is great for hiking. Of course, the Downtown Farmer’s Market in Des Moines is one of the best in the country and is a must! We’ve got a few great spots here, including Kansas City (Worlds of Fun and Oceans of Fun, Schlitterbahn Water Park, Zoo, and Deanna Rose Children’s Farmstead) Meramec Caverns (on our list of things to do), and St. Louis (the Zoo, City Museum, Gateway Arch, Science Center, Forest Park are all great options with kids). From personal experience, the KC Zoo is a lot of walking and the City Museum in St. Louis is great for slightly older kids (think 8+). We loved our trip to the Wisconsin Dells, but be prepared for touristy attractions galore. 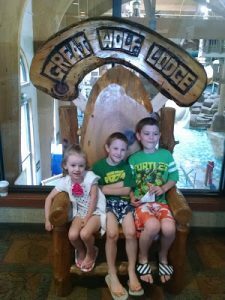 I cannot recommend Great Wolf Lodge enough for your stay (especially if you have younger kids) or the Wilderness Resort. Other fun things to do: zipline, Devils State Park, Canyon Tours, Duck Boats, and the Riverwalk downtown Dells. If tourist attractions aren’t your thing, check out Door County for some time relaxing on the Lake. For an up-close look at our time in the Dells, visit here! 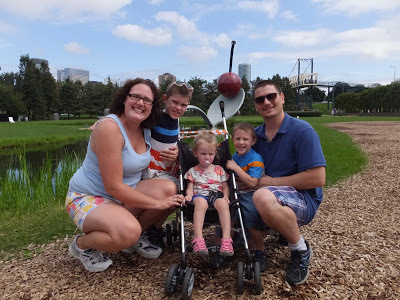 Chicago may be a big, busy city but it also has great museums for kids! Adler Planetarium, Shedd Aquarium, Field Museum, Museum of Science and Industry, and the Art Institute are our favorites (be aware that the Art Institute is not a hands-on museum. More suitable for older kids or teens). Navy Pier is great for the Ferris Wheel (a brand new Wheel opens soon) and features a Children’s Museum. 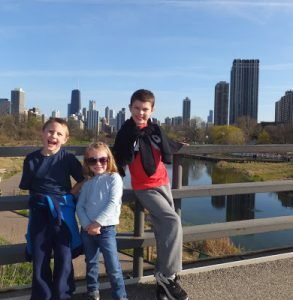 Lincoln Park Zoo is completely free, walking or biking the trail along Lake Michigan is a personal favorite thing to do, Millennium Park, Grant’s Park (also my favorite park I’ve ever been to and where Hubs and I got engaged), Willis Tower and Hancock Observatory is also fun for kids. Tip: Plan on paying for parking pretty much everywhere. You’ll be hard pressed to find a hotel in Chicago that has free parking. One option would be to stay in the burbs and take the train in. Our go-to option is to find a hotel downtown, pay the hotel’s parking fees (usually a daily fee), and walk everywhere. We try to stay in the Museum Campus area/South Loop because everything is an easy walk. The Children’s Museum in Indianapolis is completely worth your time and money, especially for kids 10 and younger. 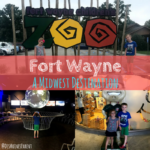 While you’re in Indy, check out the downtown area, the Zoo, and the Motor Speedway Museum. 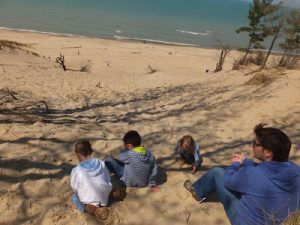 Drive two hours north of Indy and check out Indiana Sand Dunes National Lakeshore (pictured below). Hike the trails, climb the Dunes, and then slide/roll back down. Take a minute to dip your toes in Lake Michigan and run from the waves crashing against the shoreline. Read about our recent trip for more info here! Silver Lake Sand Dunes and Mackinac Island would be great, relaxing destinations. We’ve been told by friends who have been there recently, that the Sand Dunes in Michigan are spectacular. The Silver Lake Sand Dunes are up for our next whirlwind weekend road trip. If you’re a roller coaster lover, Cedar Point in Sandusky is the place for you. This would be a great destination if you have older children who meet all of the height and weight requirements for the rides. Other great places to visit in the state: Rock and Roll Hall of Fame (I may or may not require my kids to listen to rock n’ roll on the drive there), the National Underground Railroad Freedom Center (great for kids 4th grade and older), A Christmas Story House (isn’t that some kind of an icon? ), and of course the gorgeous Hocking Hills State Park for hiking, cave exploring, waterfalls, and more. Read local reviews of hotels, restaurants, towns/cities, etc. Nothing will give you a better idea of how good or bad a place is than what the locals think. Along those lines, start following/reading local parenting blogs of the places you’ll be visiting. We’re headed to Tennessee and surround area this summer and my greatest finds (place to go, hike, look out points, playgrounds, free things to do, family friendly restaurants, etc.) have been from “mom blogs.” They have excellent tips and honest opinions that the travel sites just can’t give. Have a rough itinerary but know that nothing may happen according to the itinerary. Be flexible, especially when travelling with kids. It’s taken us three years to find our travelling stride, but now we can pack the kids in the minivan and declare, “we’ll be driving ten hours today!” and no one bats an eyelash. Pack plenty of snacks, water bottles, books, DVD’s, and games to play while on the road. 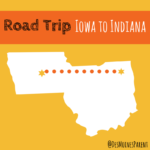 During our Indiana road trip, we did away with the Kindles because I didn’t want the kids fighting over them (we only have 2 Kindles but 3 kids…you get the picture). The kids did a great job keeping themselves preoccupied. We also watched several movies while traveling. Drive when it suites the kid’s schedules, not your’s. My kids do better traveling in the evening and at night. Luckily Hubs and I are night owls so this fits all of us. After a busy day, pack up the car and head out. The kids quietly watch movies, read their books, and drift off to sleep while we keep the coffee coming. For more road trip tips, visit here! 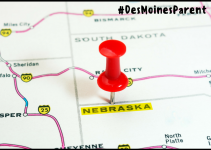 Check out Day Trip to Ames, Iowa! 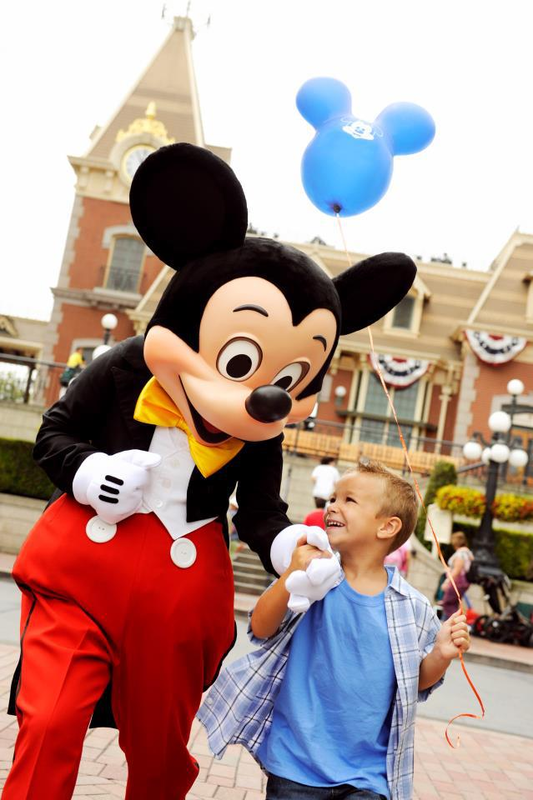 Or our Ultimate Mini Getaways Guide! Ashlen Sheaffer is a proud Des Moines resident who was born and raised here. 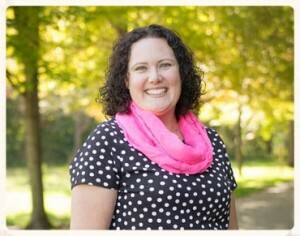 Ashlen wears many hats: mom, wife, daycare provider at her in-home daycare, blogger and co-owner at The Kidsperts, children’s book author, and codirector and producer for the upcoming play Expressing Motherhood play. 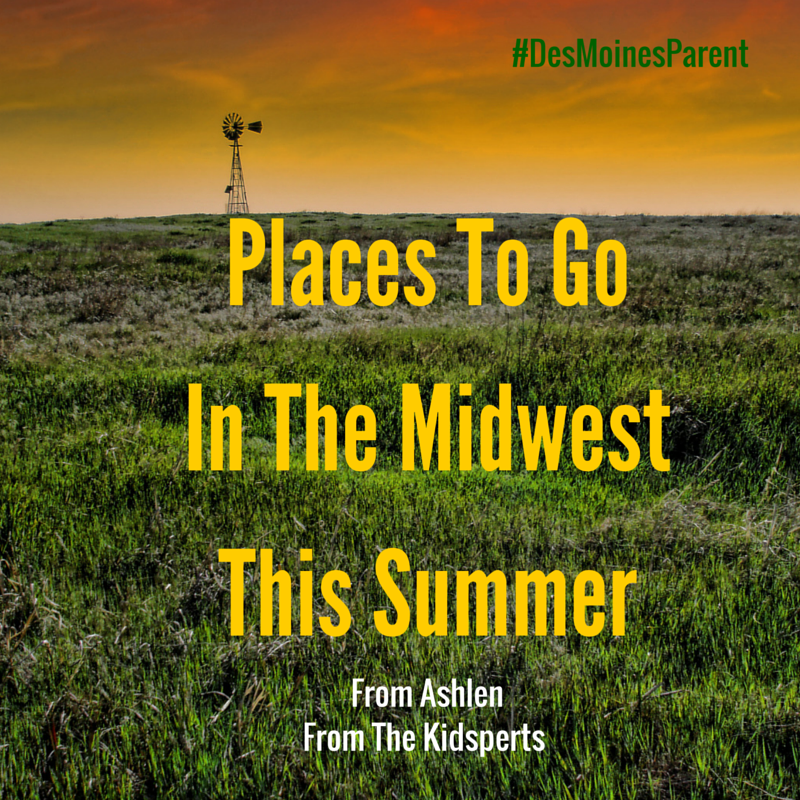 In her free time Ashlen enjoys exploring all Des Moines has to offer, road trips, and adventuring all with the kids in tow. Ashlen is super excited to be able to share some of her family’s adventuring with other Iowans and get other families out into the community.